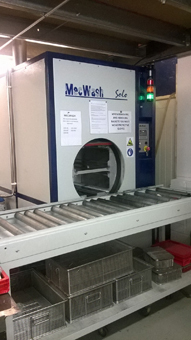 When a Hampshire-based manufacturer of DC contactors and disconnect switches wanted to ensure its components met the highest quality of cleanliness standards it decided to install a MecWash aqueous-based cleaning machine so it could bring the majority of its cleaning systems in-house. “Some machine brass parts also used to go for sub contract cleaning but since the introduction of the Solo machine we are now able to clean more than 90% of our parts in-house and this means we have made a substantial saving on the costs of cleaning. “Brazing relies on capillary action and this will only work properly if the surfaces of the metals are completely clean. Any oil and dirt residue remaining from the production process has the potential to significantly impact the efficiency of our products and could therefore adversely affect our reputation. “We are delighted with the solution MecWash proposed and the Solo has proved to be perfect for our needs and, more importantly, those of our customers,” he added. John Pattison, managing director of MecWash, explains: “It is essential when making components that preservative oils, machining lubricants, metal swarf and chips are removed. 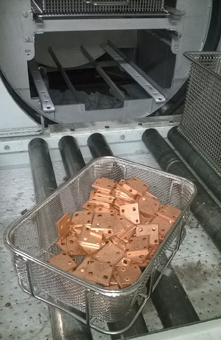 “This is where our Solo machine is able to provide the precision cleaning needed by Albright’s clients, ensuring the contactors and switches produced are fully clean and dry before the brazing process is then carried out. “We have already supplied more than 200 Solo machines to clients around the world and they prove particularly popular because they have a very compact footprint which saves valuable floor space, especially when customers want to complete all of their processes in one facility. “The Solo is also easy to use, having a centrally loaded, rotating drum within which components are subjected to programmable flood, spray washing and drying processes, making it ideal for in-house operations as it requires little training to operate. We are finding more customers are seeking such solutions to not only reduce their manufacturing time but also to ensure they have full control over the production times,” he added. Albright manufactures from its head office in the South of England and two wholly owned factories in China and Lithuania and has dedicated Sales Offices in China, France, Germany, Japan and the UK with further international distributors as well. Pictured top is the MecWash Solo at the Albright factory and below are some of the manufcatured brass components after cleaning.